Have a spare orange lying around? Here’s a bonus quick one you can freehand while you have all of your carving gear out from the recent polyhedral fruit extravaganza. Stick a skewer all the way through the orange, from the stem end through the center and out the other side. Grab your curved paring knife, too. Hook the tip of the knife behind the skewer, and start turning the orange and cutting around and around the stick, keeping that tip hooked behind it, while spiraling down the orange. Here’s what it looks like after one full turn. You can make the spacing between turns of the spiral wide, as shown, or narrower — whatever strikes your fancy. Keep turning until the knife comes out the other end of the orange. Then pull out the skewer and stretch the fruit out lengthwise, and voilà, you have a helicious orange. If you’re miffed that you cut and cut all the way through the orange and it stayed in one piece (how did that happen?) and you have a grapefruit handy, try making a double helix. Start exactly the same way, but be sure to leave a pretty wide spacing between your turns. 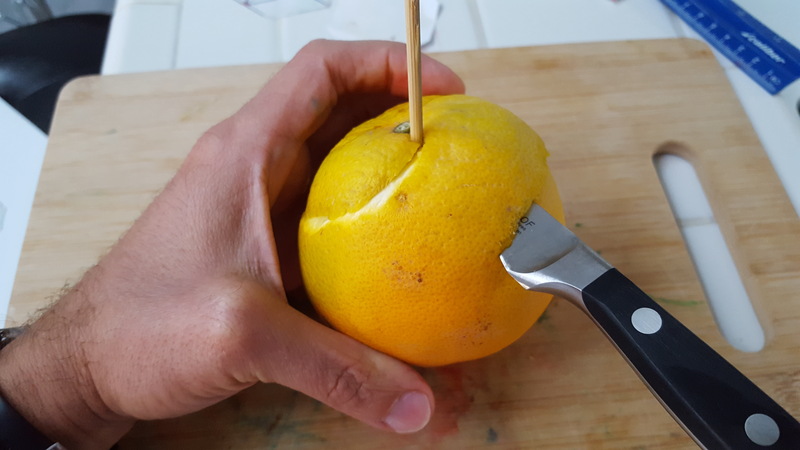 When you’ve gotten all the way through, turn your grapefruit around the skewer axis so that it is 180° from the position in which you started cutting, and repeat the procedure, staying halfway between the prior cuts at all times. When you’ve come through again, you can “unscrew” the two pieces from each other to create matching helices, a lovely garnish for any mathematical meal. Enjoy!